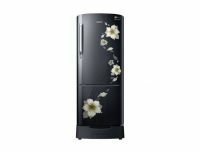 Samsung Single Door 192 L Fridge that works on Works on Home and Solar Inverter vs LG GL-B201APOX Direct-cool single-door refrigerator. You can see list of our Samsung RR20M182ZB2 vs LG GL-B201APOX below, perform Side-by-Side comparison. If you need further help, do have a look at Conzumr Guides and Tips. Alternatively you can view all Refrigerator to choose your own favourites. Bring home the Samsung RR20M182ZB2/HL 192L Direct Cool Refrigerator and experience a thoroughly efficient modern day refrigeration. The refrigerator is designed to deliver powerful cooling performance to ensure maximum freshness of your food items for prolonged duration. Its freezer section comes with the Cool Wave feature, which keeps food chilled for up to 9 hours during power outages. Maintaining a temperature below 0°C, it assures the ideal cooling retention. To Recieve updates and possible rewards for LG GL-B201APOX please sign in. To Recieve updates and possible rewards for Refrigerator please sign in.